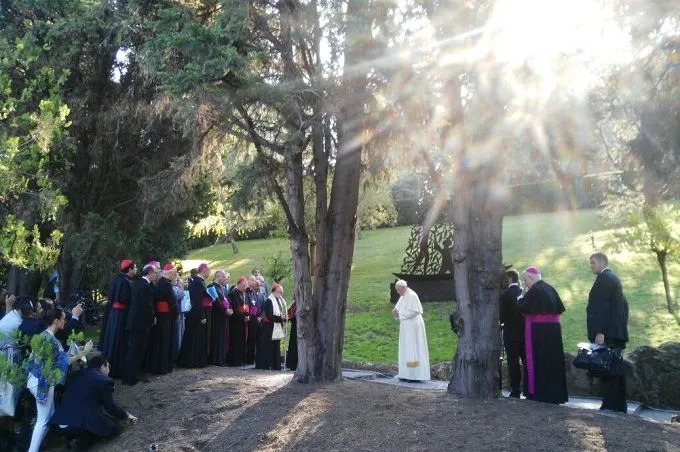 Pope Francis prays during the inaguration of the statue of Our Lady of Aparecida in the Vatican Gardens Sept. 3, 2016. Credit: Maria Ximena Rondon/CNA. Vatican City, Sep 3, 2016 / 07:33 am (CNA/EWTN News).- Ahead of his meeting with volunteers Saturday, Pope Francis decided to pop in for the inauguration of a new statue of Our Lady of Aparecida in the Vatican Gardens. The fact that the statue has been placed in the gardens is significant, since they have not received a new piece of art since 2010. The statue, designed by a Brazilian artist, is a joint initiative of the Archdiocese of Aparecida and the Embassy of Brazil to the Holy See. Cast in bronze, it depicts a boat with three fishermen holding a full fishing net, and frames a replica statue of Our Lady of Aparecida. Pope Francis during his 2013 visit to Aparecida. In Sept 2016, the Pope blessed a replica of the statue in the Vatican Garden. (Vatican Radio) Thousands of volunteers and “workers of mercy” took part in a special Jubilee Audience with Pope Francis on Saturday morning in St Peter’s Square. Following a morning of song and dance, with testimonies from volunteers from all over the world, Pope Francis spoke on the theme of love, basing his reflection on the St Paul’s hymn to love from the First Letter to the Corinthians. “This teaching must be for us an unshakable certainty,” the Pope said: “The love of God will never diminish in our lives or in history.” God’s love, he said, is “youthful, active, dynamic” and has “an attraction beyond all telling.” It is faithful and fruitful. 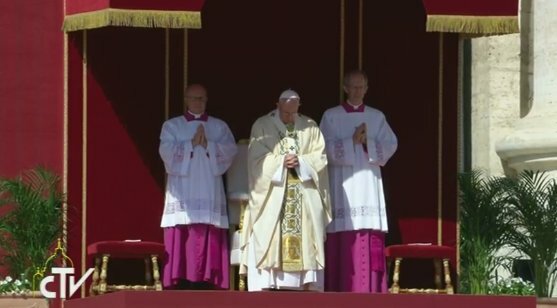 (Vatican Radio) On Saturday, Pope Francis marked the Jubilee of Volunteer Workers by presiding over celebrations in St Peter’s Square, the latest event in the Holy Year of Mercy. During his catechesis to the volunteers, the Pope stressed how the Church is called to be close in need. He encouraged volunteers in their solidarity towards others, especially in a world tempted by indifference. The Holy Father concluded by citing the example of mercy shown by Blessed Mother Teresa, who he will canonize on Sunday at the Vatican. The portrait of Mother Teresa that will be displayed on the façade of St. Peter’s Basilica at her Vatican canonization on Sunday, Sept. 4, was commissioned by the Knights of Columbus and painted by renowned American artist Chas Fagan. A graduate of Yale University, Chas Fagan has painted portraits of all the U.S. presidents — a collection that regularly tours the country for the White House Historical Association. He lives and works in Charlotte, N.C. Feels like just yesterday that folks were griping over a lack of profile and clout for women in the church…. Hmm. Pope Francis presides over Holy Mass and the Canonization of Blessed Teresa of Calcutta, followed by the Marian prayer of the Angelus. (Vatican Radio) During the Canonization Mass for Blessed Mother Teresa, the Prefect of the Congregation for the Causes of Saints, Cardinal Angelo Amato presented a brief biography of the Church's newest Saint in the presence of Pope Francis. Card. Amato asks #PopeFrancis to declare Mother Teresa a saint. 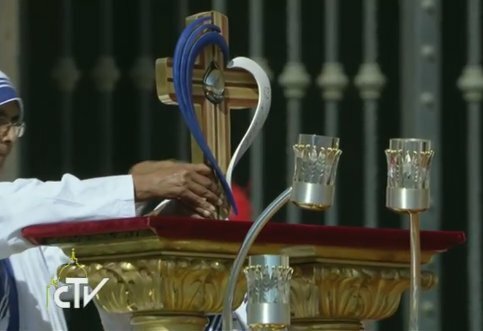 "Veni Creator Spiritus," invokes Holy Spirit before #PopeFrancis proclaims #MotherTeresa is saint in heaven. she is to be venerated among the Saints with pious devotion. The reliquary containing a few drops of blood of Saint Teresa of Calcutta. 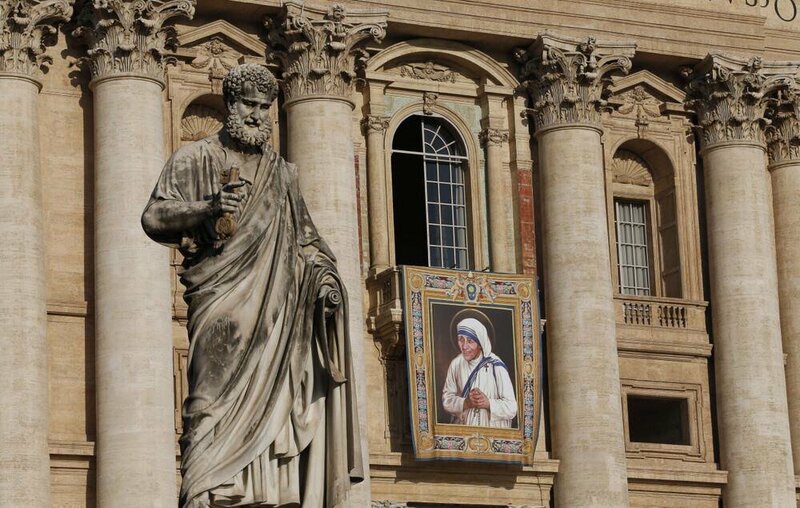 (Vatican Radio) Pope Francis on Sunday celebrated the Rite of Canonization for Mother Teresa of Calcutta, at a Solemn Mass offered in St Peter’s Square. (Vatican Radio) At the conclusion of the Mass in which he canonized Mother Teresa of Calcutta, Pope Francis led the faithful in the customary Sunday recitation of the Angelus. (Vatican Radio) Pope Francis on Sunday declared Mother Teresa of Calcutta a Saint, saying that she shone a light in the darkness of the many who no longer had tears to shed for their poverty and suffering. To the some 120,000 pilgrims who filled the Square for the canonization Mass, Pope Francis held up Mother Teresa as the model for a Church that goes to the peripheries to bring comfort and the light of the Gospel to poor and wounded souls. “Let us carry her smile in our hearts – he said - and give it to those whom we meet along our journey, especially those who suffer” he said. And admitting that even he will find it hard to call her “Saint Teresa” because her holiness is so tender and fruitful that we will continue to spontaneously call her “mother”, Francis praised her as the merciful saint who defended the lives of the unborn and those abandoned and discarded. (Vatican Radio) Pope Francis is offering Neapolitan pizza to 1,500 people which will be served Sunday afternoon in the atrium of the Paul VI Hall following the canonization of Mother Teresa. The lunch guests traveled at night in coaches to attend the lunch which will be served by around 250 Sisters of Mother Teresa, 50 Brothers of the congregation for men and other volunteers. (Vatican Radio) The celebration of the life and sanctity of Mother Teresa of Calcutta will continue in Rome in the days following her canonization on Sunday. On Monday, the 19th anniversary of St Teresa’s death, the Vatican Secretary of State Cardinal Pietro Parolin will celebrate a Mass of Thanksgiving for the canonization, with tens of thousands of pilgrims expected to attend. Later on Monday, the relics of Mother Teresa will be moved to the Papal Archbasilica of St John Lateran – the Cathedral of Rome – where they will be exposed for the veneration of the faithful. The veneration of the relics will continue on Wednesday and Thursday in the church of Saint Gregory on the Celian Hill (San Gregorio al Celio). On those days, the faithful will also have the opportunity to visit the rooms of Mother Teresa in the convent of the Missionaries of Charity next to the church. 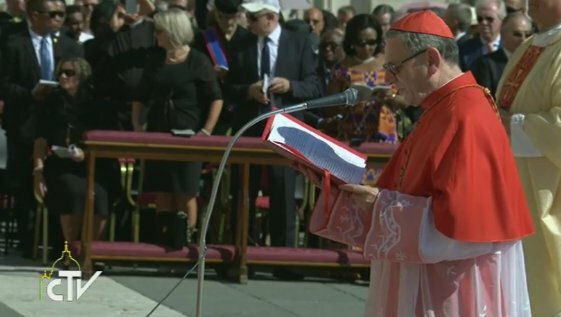 In his homily for the Mass in St. Peter’s Square, Cardinal Parolin recalled several key moments of her life and the thirst for God which drove her every action. (Vatican Radio) A surprise meeting on Tuesday morning in the Vatican made the day for a group of young pilgrims from northern Italy who has cycled to Rome in pilgrimage for this Holy Year of Mercy. The young people have travelled on bicycle down the backbone of Italy from two parishes that are part of the Milan diocese. They intend to resume their pilgrimage with a torchlight procession ‘on wheels’. “The Pope even pledged his personal help ” – she told Vatican Radio - “an economic contribution that will help us ‘adopt’ the African hospital and help it to grow by providing medical formation, by establishing a school that specializes in pediatric care and by building new wards”. (Vatican Radio) Pope Francis on Wednesday greeted Ricardo Quaresma, a member of Portugal’s national football team which won the European Championship this summer. The encounter happened during the weekly General Audience.